That’s right: There’s now a stretch of parking-protected bike lane on Jay Street in downtown Brooklyn. The project’s not done yet, but this afternoon DOT tweeted this photo showing a rideable section on southbound Jay near Myrtle Avenue. 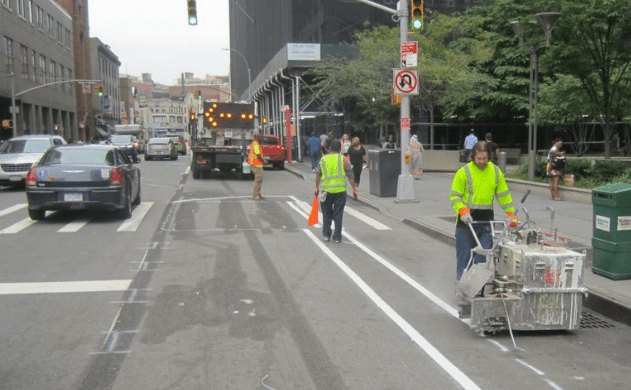 Implementation of the Jay Street redesign began last Thursday, when crews started to remove the old un-protected bike lane markings overnight. When finished, it should make one of the most important links in the bike lane network much less chaotic — if the parking placard abusers who currently block the bike lane change their law-breaking ways. The finished project will extend from Fulton Street to Sands Street at the entrance to the Manhattan Bridge [PDF], and it includes a new signal to control traffic coming off the bridge north of Nassau Street. Keep us posted as this important bike network upgrade takes shape — send your photos to tips@streetsblog.org. Let’s see how well the DeBlasio/Bratton NYPD officers respect this. I hope they respect it fully, but there has been little to no indication that they intend to. Yah, my thoughts exactly. You got court houses and other government buildings. You have the legitimate need for some deliveries . . . .
From 59th Street to 43rd Street there's now a green curbside bike lane on Second Avenue (tuff curbs to come). The remaining gaps in the bike lane are near the Queensboro Bridge and Queens-Midtown Tunnel. This short, contraflow parking-protected bike lane segment gives cyclists a safe, direct route out of DUMBO.